Taking place a few years after the ending of Jane Austen's Pride & Prejudice, enough time for Darcy and Elizabeth to have a couple of sons, the main plot of Death Comes to Pemberley deals with a murder on Pemberley property, and the suspect is none other than... DUN DUN... GEORGE WICKHAM. However, Darcy and Elizabeth are convinced Wickham couldn't have possibly committed the heinous crime of bludgeoning his best friend (whose name is escaping me right now) to death. They are faced with a mystery, with the outcome being life or death for Wickham. 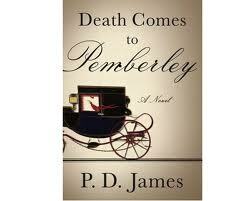 If this were just a mystery set in early 19th-century England, it would not be that bad. It was a decent mystery, and the outcome was not obvious. James did her research on the period, too, so it seems genuine. The writing is good, but my biggest problem with the novel was the characterization. I understand it's difficult to try to continue a story that is so deeply ingrained in our literary consciousness, but I found it hard to believe I was reading about the same characters in Austen's novel. I felt James took liberties with the characters, which is understandable considering the fact that she is writing a new story, but being such a fan of the original I was not impressed with the outcome. Rosalyn Landor was a good narrator. Nothing remarkable, but she had a proper British accent that fit the story well. If you like Georgian-era novels and mysteries, you might enjoy this latest P&P sequel/continuation/whatever you want to call it. If you are a purist and don't like anyone messing with your Austen, I would just move on. Disclosure: I got this audiobook from the library. I completely agree. The liberties she took with the characters upset me because she didn't stay true to the foundation already in place. I was disappointed because the book was getting a lot of hype. If it weren't a P&P adaptation, it would be better. I felt the story was more about waiting for the inquest and then the trial than any part on the mystery. I loved the language of the book, but the story really fell flat for me, too! I SO wanted to like this book! But I couldn't get into it at all. It was more the pacing/narrative voice for me. SIGH. And I am usually up for a Jane Austin retelling. I agree! This would have worked really well as a period mystery but it felt kind of weird with the Pride and prejudice characters. Especially Elizabeth. She just didn't seem like the same person to me. And neither did Darcy for that matter. And if your main characters aren't right that's usually not a good sign. I was not a big fan of this book either. If it was a regular old period mystery book it could have worked. The idea of following Pride and Prejudice and using those characters seemed to have ruined it for me, just because nothing seemed the same.